Have you ever seen the movie, “It’s A Wonderful Life?” I’m guessing most of us have with the exception of a few. In the 1946 movie “It’s A Wonderful Life,” George Bailey played by James Stewart, wishes he had never been born. An angel (Henry Travers) is sent to earth to make George’s wish come true. It is then that George starts to realize how many lives he has changed and impacted, and how they would be different if he was never there. As you know I teach culinary classes throughout St Louis, Missouri, in public venues, non-profit organizations and the homes of my clients. I frequently teach at a cancer organization here in town that offers a variety of classes to cancer survivors. It’s an incredible facility and one I feel proud to be affiliated with. It was during one of my classes there, that I learned a lifelong lesson. After my class, a student who I’ll call Sarah, walked up to me with hope and sadness in her eyes, and said, “This was the best 2 hours I have had in months.” It was just what she needed to get her mind off her problems. Sarah had cancer, was going through treatments, plus as a result had suffered multiple complications from the cancer, and treatments. Her life felt unbearable – yet during the 2 hours of my cooking class she totally escaped and forgot about them. She felt at ease talking with me in class, and said the entire experience was fun, relaxing, and rejuvenating. Sarah couldn’t thank me enough. I would have never known the impact I had on Sarah that day had she not shared it with me. How many other lives had I affected through my classes there, or for that matter anyplace else? How often had my actions affected others on a daily basis, whether from a smile, a simple act of kindness, or just taking a few minutes out of my day to be with someone or talk with them? Of course when I’m fussy, what impact did that have on someone as well? 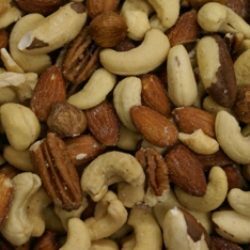 For those of us who have been fortunate to have good health and happiness, have you ever stopped to think of all the little things you might complain about? Why do we sweat the small stuff when there are so many bigger things in this world to be concerned with? Whether you operate a large business, small business, a sole proprietor, or for that matter in your everyday life – remember to treat others how you would expect others to treat you. How we behave has a direct effect on those we interact with. Sarah’s comment had a huge impact on my life/business, and opened my eyes, a fact she’s probably unaware of herself. Think about it! What impact have you had on someone else’s life, and how have they yours? Chances are neither of you truly has a clue. Just like George Bailey in “It’s A Wonderful Life” I too discovered the effect my actions had on someone. While I thought nothing of what I was doing or teaching, I realized from Sarah that every little action I do, creates a reaction. Don’t forget, whether in business or in life, think before you act – while we may never know how another perceives us, I feel confident we’d hope it to be positive! A recipe that Sarah enjoyed in my class and couldn’t wait to try when she got home was this Whole Roasted Salmon that I prepared. She has since made it for her family and they enjoyed it too. I thought I would share it with you as well. Rub the cavity of the salmon with 1 tablespoon of the olive oil. 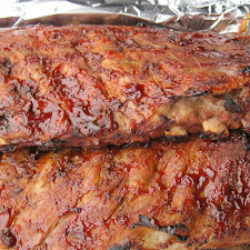 Lightly sprinkle the cavity with salt and pepper. Using a mandolin or very sharp knife, cut the lemons crosswise into paper-thin slices. Lay half of the lemon slices inside the cavity of the salmon. Strip a small handful of leaves from the thyme sprigs and scatter them over the lemon slices. Rub the outside of the salmon with another 1 tablespoon olive oil and sprinkle with more salt and pepper. In a bowl, toss the fennel slices with the remaining 2 tablespoons olive oil to coat thoroughly. Spread the fennel in an even layer on a large, deep, rimmed baking sheet or large roasting pan lined with parchment paper. Place the fish on top. If just part of the head and/or tail of the fish fall over the edge(s) of the pan, gently curl the fish to fit inside the pan. If more than that extends over the edge(s) of the pan, you can cut the fish in half crosswise and place the halves side by side. Top the salmon with the remaining lemon slices, arranging them attractively. Place the remaining sprigs of thyme and fennel fronds over and around the fish. Roast fish for 15 minutes, and then reduce oven temperature to 425F degrees. Pour the wine into the pan, surrounding the fish, continue roasting until the flesh is opaque throughout (use a thin-bladed knife to peek) or an instant-read thermometer inserted into the thickest part registers 130F. Start checking at 30 minutes; it may take up to 45 minutes, depending on the size of the fish. Remove the salmon from the oven allowing it to rest for 10 minutes, or cool to room temperature. 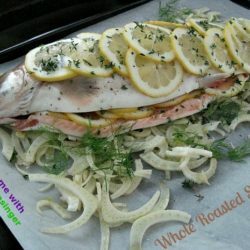 Serve the salmon whole, directly from the pan, or transfer the fish to a serving platter and arrange the fennel around the fish. Encourage guests to help themselves to a portion of the fish and some sliced fennel. We all should have a grateful attitude..life is just too short to concentrate on the negative side. Your whole roasted salmon looks splendid! I agree Angie. I think sometimes we get caught up in the hussle and bustle of everyday life and things just get away from us. There’s no excuse though. Yes the salmon is wonderful! I hope you’ll try it. Nice story. 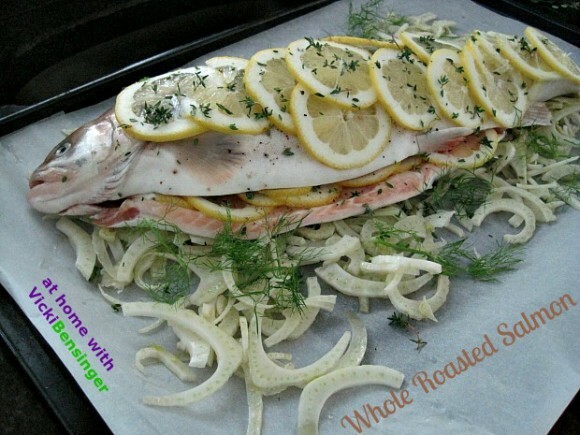 And great recipe — whole roast fish is always so great, isn’t it? Thanks for this. 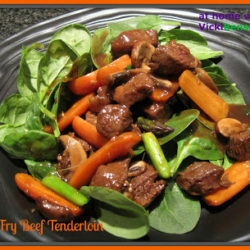 its a great dish I hope you’ll try it. It’s perfect for company. This post made me cry because the other day when I went to visit our oldies at the nursing home, I brought a big bag of chocolate bunnies for the friends I’ve made there. 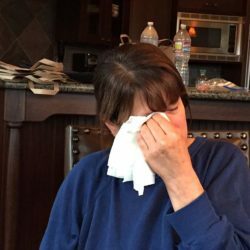 One woman burst into tears and said I was the only one who treated her as if she weren’t old. I did the same thing you did – I went to the car and cried. Not for them but for myself. I was feeling sorry for myself because what I did was nothing in the big scheme of things for me but it meant so much to be remembered. The bunny was just the reminder. We are all so busy with our own lives that we don’t realize the impact a bit of time makes to someone else. I love the salmon dish! I know Maureen. It really does touch a nerve or soft spot. You know we are all hopefully going to get old and if not we could suffer from an illness like Sarah. If we put ourselves in their place we can see things differently. Sounds like we both learned a similar lesson. I think it’s wonderful what you’re doing. It feels so much better to be on the giving end, IMO. I’m glad I can do it as I’m sure you are as well. Thanks for sharing that. I hope you like the salmon if you try it. What a touching story, Vicki. And such a good life lesson. Keep up the good work, my friend!!! P.S. Your salmon looks wonderful! Thanks Liz I appreciate it. Thank you for sharing that story. And I grew up watching that movie with my mom – it’s one of my favorites! This salmon looks delish! I would venture to say most of us that watched It’s a Wonderful Life discovered it through our mothers. It’s a great movie! Vicki, it is very nice of you sharing your experience…I must admit that I often forget how fortunate I am…and take many things for granted…when I hear or see people getting through hard time without complaining, I get myself thinking…it is very true that our actions really can impact others…and why not in a positive way? Having been in education for over 35 years, I can say that there is no greater job than teaching! And it doesn’t matter what you teach, you always have an effect on someone’s life. I totally understand your reaction to Sarah. It makes you feel sad and good all at the same time. Sad for her and good that you made her feel better. What a great feeling! And it doesn’t take much does? Sometimes it’s just a smile. 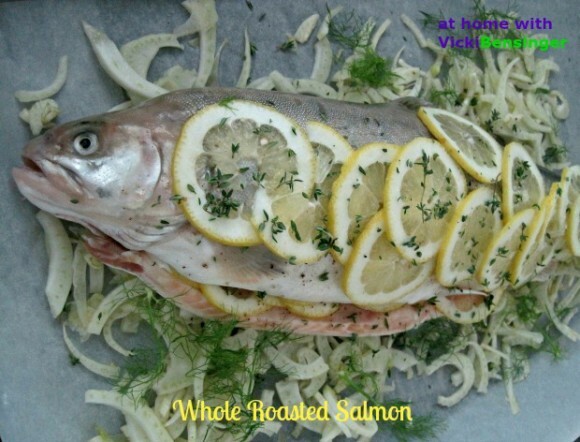 🙂 Your whole roasted salmon looks freakin awesome Vicki! Bet the fennel was a great complementary flavor! A great story, Vicki! I worked in healthcare for many years before I retired, and I would sometimes be overwhelmed with patients, phones and insurance companies. One day, a patient who was just diagnosed with cancer called to tell me…”you are right where God wants you to be.” and then thanked me for giving him hope, on a day where he had gotten the worst news of his life. I have never forgotten that…or how my words had an effect him! And btw…your fish looks scrumptious! What a wonderful post! You are so right about the impact we have on other people. How wonderful that she shared her feelings with you. I think the key is for us to live every day as if we might have that kind of impact, even if we never know.